Advantage is the fastest topical solution and proven to stop fleas from biting in 3 - 5 minutes after application. Advantage kills 98-100 percent of fleas within 12 hours of initial application. In addition, one convenient treatment lasts for up to one month. Advantage kills fleas before they have a chance to lay eggs, so their life cycle is broken. 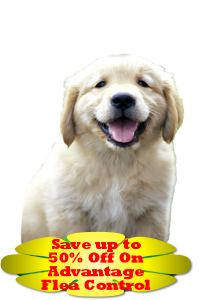 Advantage also inhibits larval development in your pet's surroundings by more than 99 percent. Advantage is water-resistant, so it kills fleas even after a shampooing, swimming or exposure to rain or sunlight. So, your cat can enjoy his or her normal activities without worry. Advantage is so gentle it can be used on eight-week-old kittens. The gentleness and effectiveness of Advantage has been proven in extensive and thorough domestic animal safety studies, so you can use Advantage with confidence. Advantage can be used on your pet no matter what its size.